I'm glad you stopped by for the Technique Junkies Blog Hop! This month the TJ Designers are showcasing projects using new techniques found in the October issue. If you didn't start at the TJ Blog, you'll want to head over there, and follow the links to the designers blogs, so you can collect the clues to spell out this months clue word. 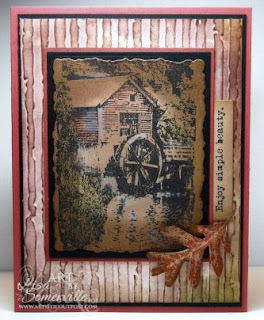 My card features the Sepia Technique found in the October issue, using Old Grist Mill from Artistic Outpost. After completing Sepia Technique, I cut my image using a Spellbinder Deckled Rectangle Die, layered on a piece of Black then Rose Red Card stock. I ran a piece of Indian Summer paper from Basic Grey through the Distressed Stripes CuttleBug Folder and added color using Caramel Ink and the CuttleBug Highlights Technique. The leaf was inked with Rose and Mustard and adhered to the card using dimensionals. Don't forget you can save 15% on all your purchases from Artistic Outpost, just use code LS-15off when you check out. Thanks for stopping by, the next stop is Beth's blog, be sure to hop over and see what she has in store for you, leave her a comment and collect your clue! Good Luck! ETA - if you've stopped by Beth's Blog, the code you are looking for there is O. There was a bit of a mix up - sorry! Ohhh so beautiful! I love anything fall!! Beautiful use of one of my very favorite stamps! Thanks for the reminder too! Wonderful card and I really love that technique. It truly looks very old - great! WOW! That is really wonderful! Thanks for the inspiration! This is a fabulous card. Stunning! Lisa, such a beautiful card! I can hardly wait to see the next newsletter! This is a gorgeous card Lisa. I really need to try that tech! I love the card. I so pretty! What a great design...and techniques...and colors! This is stunning and lovin all the techniques along this Treasure Hunt. Usually the new month means paying bills for me. Not something you really look forward to. But every other month there comes a new Technique Junkies Newsletter!!! Worth getting out of bed for, lol. Love your card and can't wait to learn the new technique. Thanks! A truly beautiful card Lisa! Absolutely awesome card. Love it.